It has been nearly two month since I stopped purchasing 4-week T-bill, once my favorite short-term investment, when its rate dropped below the rates from my online banks in June. 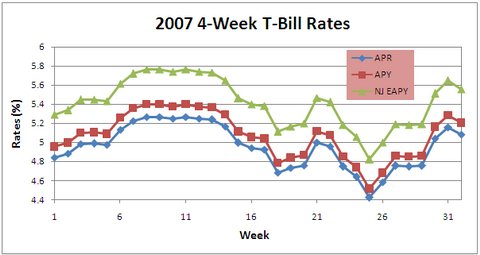 After touching the 2007 low of 4.422% APR on June 21, the T-bill has made a nice comeback in recent weeks. Yesterday’s auction set the investment rate at 5.083% APR, which is equivalent to 5.204% APY. For New Jersey residents, the equivalent taxable APY is 5.56% (here’s the formula to calculate EAPY and the complete process of investing in T-bill). Though the yield doesn’t match the promotion rate of 6.00% APY from FNBO Direct (Umbrella Bank has a similar offer), it does make 4-week T-bill again an attractive option for me, if it can maintain the current level. That, however, is not a sure thing.